What you are looking at here is the lowest calorie pistachio milkshake you have come across until date, loaded with vitamins, delicious with its nutty flavour, it’s my new favourite drink! The Pistachio, family to the Cashew, well known for it’s purple skin and green flesh, it is not only unique to look at but also has a very distinctive flavour. Pistachios are one of those nuts that not only taste great (to the point of addictive in my case) but they are used in a variety of culinary dishes as well as sweet desserts – pistachio – ice cream flavour being one of the most well known. I personally like pistachios due to the fact I can tell myself (as I eat them endlessly) that they are filled with health benefits for me. INGREDIENTS – to make a small tumbler worth of milkshake, like in the picture. • 100ml of milk (I used Alpro Coconut Milk as it is the lowest calorie milk ever and the taste is just divine) but you can substitute any type of milk you like here. • Put the pistachios to soak in the 200 ml of cold water, for about 4 hours. • After the 4 hours are up, take the pistachios out the water (KEEP THE WATER) and place in the blender, blend together with the ice cream until a nutty, bitty mixture is attained. • Add in the ‘pistachio water’ and blend further, then add in the milk and blend until fully blended. • Add in the sugar and blend for a few more seconds. 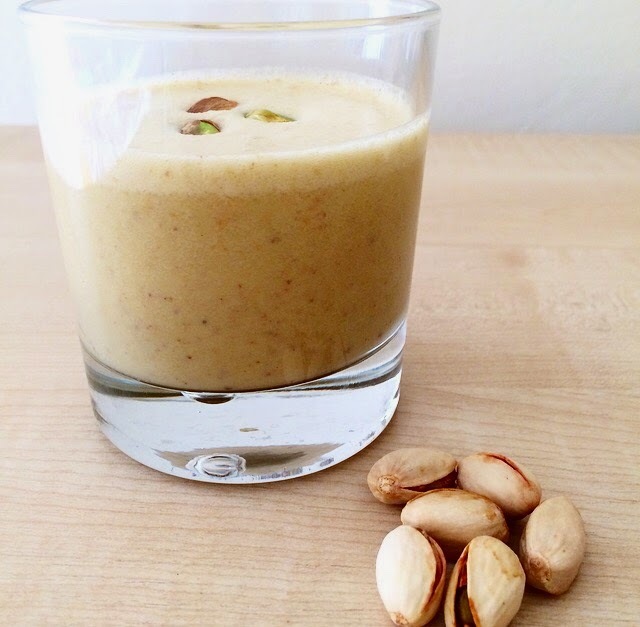 • Pour into a glass and serve with some pistachios on the top. Refreshing, tasty & low calorie in just a matter of 10 minutes!